Malene offers her services all day long, except between 2am and 6am, when she is sleeping on her bedroll behind the counter. Malene's attire consists of lower-class clothing and includes a collared shirt, coarse linens and stitched leather shoes. She also carries a small amount of gold in her pockets. The first time you meet her, she will be relieved and say: "Thank goodness someone that can help is here!" When you talk with her she will get right down to business: ”I don't know how to make this request any simpler, but to put it bluntly, Raelynn the Gravefinder must die.” If you leave the conversation without asking any more questions, she will angrily comment: "Oh, go on! Leave me then!" If you instead ask her to elaborate, Malene will tell you about her unpleasant neighbor: ”A few months ago, that witch of a Necromancer decided to inhabit Moss Rock Cavern just north of my inn. I don't know what she does in there; frankly, I don't want to know. However, I do know that after she arrived, the woods at night became unsafe. I've seen undead of all types walking in the dark woods near the cave entrance. Now, this area's getting a bad reputation and my business has waned. Every day, it seems the number of undead increase. If someone can get into the cave and kill Raelynn, maybe we can stem the tide. Her death pays a handsome bounty. I hope you'll take advantage of the opportunity." She will send you on your way with: "Raelynn will finally get what's coming to her." After your battle against Raelynn, getting close to Malene will cause her to say: "I could use some good news right about now." She will then greet you: "I assume you've dealt with Raelynn appropriately." When you tell her about Raelynn's death, a rather sad Malene will respond: ”I realize it's in poor taste to celebrate anyone's demise, but Raelynn was evil through-and-through. You've done the right thing. I believe we had a contract. Here's my part.” She will bid you farewell with: "Thank you for saving my business, I won't forget it." The next time you talk to her, a service-minded Malene will ask: "What can I do for you today?" 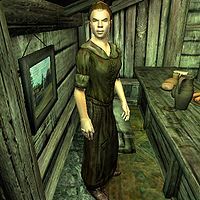 If you meet her early in the game and ask her about "rumors" she will mention a small settlement known as Aleswell; ”Still no news out of Aleswell since everybody vanished. Strange business." And she is more than happy to give you the details: ”A small settlement to the northwest of here, on the other side of the Silver Road to Bruma. We've had travellers through recently that say it's turned into a ghost town. Everyone vanished without a trace.” After that, the quest Zero Visibility will be added to your current quests.